Forming a business can involve many considerations complex and decisions. The entity structure will impact how owners get paid, how they are taxed, and which set of regulations to follow. State and local laws will also affect the process by determining which licenses, permits, and registrations are required. 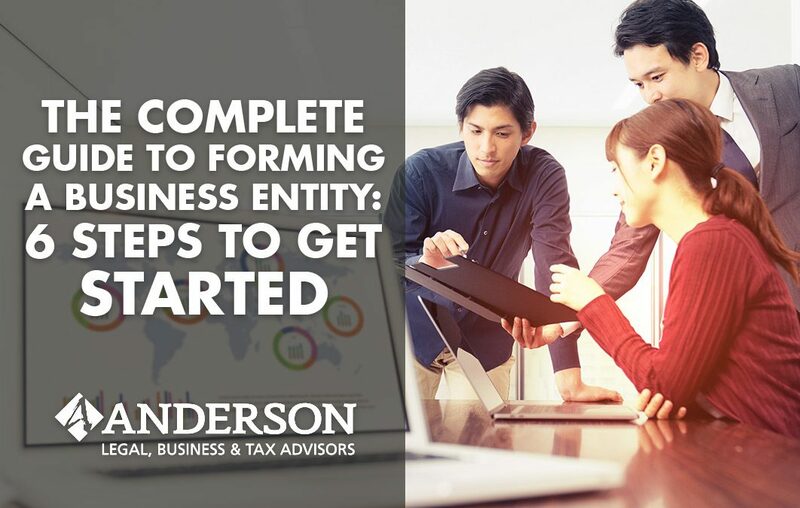 If you’re interested in forming a business entity, here are the basic steps to follow. What Kinds of Entities Can You Form? When starting a business, there are many types of business entities you can choose to form. They vary based on key considerations, such how many owners there are in the company, what liability protection is needed, and the impact of taxation. Other factors include possible investors, state and local laws, and business activity. The entity options range from single-owner companies, such as sole proprietorships and single member limited liability companies (SMLLCs), to more complex entities involving multiple owners. Two or more members can form a multiple member LLC, partnership, corporation or S corporation. These business entities can be used in various ways and in conjunction with each other depending on federal, state, and local laws. For example, two members can form an LLC and then use that LLC to form a limited liability partnership with the same two members– with the LLC acting as the general partner. However, it is important to realize that some entity combinations will not be valid. The owner of a single member LLC (SMLLC) cannot form a partnership with that LLC and himself. A single-member LLC is considered a disregarded entity, which means the partnership really only has one person in it and is therefore not eligible for a partnership. A sole proprietorship is the most basic and simplest of the available business entities you can form. In this entity, the business owner and the business are the same. You may not need to file with state or local registers. A sole proprietorship also typically does not require an operating agreement or bylaws to dictate how it will function. However, it is a good idea to follow the basic steps of starting a business, such as ensuring your business name is not already taken. This is especially true if you plan to build a recognizable brand. It would be a shame to put in time and effort to develop your brand, only to find out that your business name is already taken, and you need to rename your business in order to expand. A simple online search by state will provide info on companies that are registered. A sole proprietor that wishes to do business under a different or fictitious name can register that name using a Doing Business As (DBA). Depending on your plans for expansion, you may also want to look into trademark protection. Sole proprietors will report business income on their personal tax returns using IRS Form 1040 (Individual Income Tax Return) every year, along with IRS Schedule C (Profit or Loss from Business) and IRS Schedule SE (Self-Employment Tax). One key issue with sole proprietorships is that they offer no liability protection for owners and less tax advantages than corporations. Since they are considered one and the same, the owner is n personally liable for any business debt, and personal assets can be used to satisfy those debts. It may be a good idea to secure insurance to help cover any liability issues that may arise. Two or more owners can decide to form a partnership and share responsibility for the business. A partnership can be relatively simple and easy to set up, and is defined by a partnership agreement. This agreement is similar to an LLC operating agreement, which details ownership percentages, division of profits and losses, and other key factors. The downsides of a general partnership are primarily issues of liability. Each partner is responsible for liability and debt incurred by the partnership, even if the issues are caused by another partner. There are ways to avoid shared liability, however. One option is to create a limited partnership, although there must be one general partner who is responsible and liable. For these reasons, it’s always wise to obtain liability insurance. A partnership is similar to a sole proprietorship when it comes to profits and losses, which are passed through the business directly to the owners. Partnerships file using IRS 1065 (U.S. Partnership Income) which shows income, deductions, and credits claimed. Each partner receives a Schedule K-1 from the partnership which is used on their individual income tax returns. A Limited Liability Company (LLCs) is a very versatile business entity. It provides a more formal business structure which can be adapted to many different uses. When there is only one owner of an LLC, it is considered a disregarded entity, similar to a sole proprietorship. This means profits and losses from the business are passed through to the owner, who then pay taxes. A single member LLC (SMLLC) also allows for liability protection, which means the company is considered a separate legal entity from the owner. This liability protection can help keep the owner’s personal assets safe in case of a lawsuit or unresolved business debts. Two or more members can form an LLC and elect to be taxed either as a partnership or a corporation. Keep in mind that a C corporation faces double taxation– the business is taxed on income and losses first, followed by the owners being taxed on their shares of income as well. An LLC combines the pass-through taxation of a partnership or sole proprietorship with the limited liability protection offered by corporations. A limited liability company can elect to be taxed as a C corp or S corp using IRS Form 8832 (Entity Classification Election). The Tax Cuts and Jobs Act recently provided significant tax benefits for businesses. Besides lowering the corporate tax rate and eliminating the corporate alternative minimum tax (AMT), this tax reform also provides a temporary benefit to pass-through businesses, such as sole proprietors, partners, LLCs, and some trusts. The Act allows eligible businesses to take a 20% deduction on qualified business income, as well as claim 100% bonus depreciation on the cost of assets. An LLC will use different IRS forms to file their taxes, depending on how many owners there are, how the LLC elects to be taxed, and the business activity. An SMLLC reports the pass-through taxation on their personal taxes using IRS Form 1040 and includes either Schedule C, E or F. When taxed as a partnership, a multiple member LLC uses IRS Form 1065. C corps use IRS Form 1120, while S corps use Form 1120S. Although an LLC offers limited liability for owners, there are instances when this protection can be lost. To prevent creditors or lawyers from going after your personal assets, you have to prove that the LLC is a separate business entity from the member or members. This can be done by holding regular meetings, keeping separate finances, and not using personal assets for business expenses (and vice versa). An LLC would also create an operating agreement to detail how the company is to be run, as well as declare percentages of ownership interest. An operating agreement also defines the role of each member and other important considerations. A corporation is a much more formal business entity, with strict regulations and requirements. Owners are shareholders who own shares of the company. They are paid through dividends on the shares, or through selling their shares at either a profit or loss. Some companies choose not to offer dividends and instead reinvest earnings back into the company to fund projects and expansion. The benefits of a C corporation also include a lower corporate tax rate of 21% (down from 35%). Corporations are also free from the Alternative Minimum Tax (AMT), which is a separate way of calculating taxes and is usually more severe. This business entity can also carry losses forward when calculating taxes. A corporation is not limited by its size or how many shareholders can be involved. The stable business structure and potential for growth are more appealing for investors than other, less complex entities. Investor appeal is one of the many reasons why it’s so important to carefully consider which entity type is best for your business. One of the main downsides of a C corp is that business income is double taxed– once before profit is passed on to the shareholders, and then the shareholders’ earnings are taxed again. Corporations may also be required to elect a board of directors, depending on state law. This board represents the shareholders and manages the corporation on their behalf while following applicable laws and regulations. Every corporation must have corporate bylaws which set forth the rules, how the corporation will operate, shareholder rights, responsibilities of officers, and more. Because of these and other requirements, it is typically more expensive to start and operate a corporation. An S corporation has a special tax status which allows pass-through taxation. Like a C corp, an S corp can sell shares of stock to raise money while offering limited liability protection for owners. These entities are limited to 100 shareholders and do not allow certain types of ownership, such as nonresident alien shareholders. In most ways, S corporations are quite similar to C corporations. An S corp requires the creation of articles of incorporation, and some states may require bylaws as well. IRS Form 2553 (Election by a Small Business Corporation) informs the IRS that your corporation is forming as an S corp. The S corporation will also file annual tax Form 1120-S for information purposes and provide Schedule K-1s to shareholders. Choosing a business entity for your company depends on a variety of factors. It can be difficult to know which type of business is best for your specific business. It helps to consider the tax implications, as well as how your business operates, how much liability protection you need, and whether you want investors. It is possible to change from one business entity to another, but this process can become quite complicated, especially when there are many assets or owners involved. Typically, the nature of your business will determine which business type will work best. A single owner with a small business and minimal investing needs may be best matched with a sole proprietorship or SMLLC. Lower taxes may override the simplicity, however, a business that has a low risk of incurring a large debt or lawsuit might also work well as a sole proprietorship, due to the minimal start-up costs and easy tax filing. Be aware, however, that the benefits of a sole proprietorship are offset by the costs of liability protection and lack of formal business structure. A business with members who specialize in medicine or law may consider forming an LLC or corporation. Companies with many assets, or those geared towards heavy investing and debt, may want to consider the more formal C corp and S corp entity types which offer more stability to investors. If liability is a concern, it’s a good idea to form an LLC or consider incorporating, since these entities offer some form of liability protection. A sole proprietor or partner can obtain insurance to cover their business, but their personal assets are still vulnerable. It is important to know that the liability protection of a company or corporation can be invalidated in cases of illegal activity or when the business is shown to be an extension of an owner rather than a separate entity. It is also important to consider the tax implications of each business entity. This is especially true for smaller businesses. Sole proprietorships, partners, LLCs and S corps offer simple tax advantages with pass-through taxation and lower start-up costs and fees. However, for larger businesses, especially those with many assets, a C corporation may offer better advantages despite the nature of its double taxation. It’s always a good idea to consult with a tax professional and attorney about choosing the best entity for your business. The rules and regulations governing how to form a business entity vary by state. These businesses are also impacted by federal taxes and applicable laws. To ensure you have the most accurate and up-to-date information, it is highly recommended that you consult with a professional tax advisor. Deciding on a name for your business can be difficult. For sole proprietorships, the business name can be the owner’s name, or a fictitious name can be used. It is important to first search your state and county to ensure another business is not already using that name. This can be done by conducting a free online search for that name. Each state provides a business name directory, along with specific guidelines for starting a business. A company can also choose to operate under another name by filing a Doing Business As (DBA). Since companies are formed at the state level, you may also want to check national records or even take action to protect your business name by filing for a federal trademark. The U.S. Patent and Trademark Office can trademark your mark which gives you brand protection across states (and beyond). Disputes may arise leading to legal action, in which case being able to prove you were using a business or trademark first would be highly advantageous. Determining the right legal structure can be difficult. There are many factors to consider, and each state offers different benefits and consequences for the various business structures you can form. Some states charge annual fees and even extra taxes for certain businesses. Generally, you want to consider your business needs, investor requirements, and the level of liability protection desired. You then choose to set up the entity as a sole proprietorship, partnership, LLC, corporation, or S corporation. A key consideration in starting a business is determining if you need a physical location, and if so, where it should be established. You should take some time to consider this step, as it could greatly impact your sales. Depending on the location you choose, you may also be required to obtain additional permits or zoning clearance, or even a city business license. Each state has specific laws and regulations for various businesses, so you will need to check for your state-specific guidelines. You may have to file articles of incorporation and prepare bylaws for your business. This is a good time to prepare a business plan that outlines your company and sets forth policy and long-term plans. Once you have decided on your business entity type, you can file with your state and register your business. You may also be required to obtain business licenses and permits, as well as zoning clearance and other approval requirements. You may need to contact your local state tax commission as well. Some states require certain business entities to create and submit articles of incorporation, operating agreements, and partnership agreements. Some form submissions require additional steps, such as obtaining an Employer Identification Number (EIN) from the Internal Revenue Service. You will also be required to pay a variety of fees to register and obtain these licenses and permits, which vary by state. For example, Virginia has a state corporation commission to consider. Some states require a sales tax number or permit to be obtained as well. You will also need to file annual tax returns as an owner to report income. The business entity may be required to file a tax return or information return each year. There are many financial considerations that a business owner must consider. It’s vital to keep business assets and accounting separate from the owner’s personal accounting in order to prove that a separate entity exists. This requires setting up a company bank account. Be aware that some forms of revenue, such as income from businesses, rent, and dividends, do not have taxes withheld as a paycheck does. For this reason, business owners may have to pay self-employment taxes themselves. Those that make over a certain amount may have to pay these taxes quarterly by estimating their taxes and paying in equal payments. Failing to pay estimated taxes on time and in the correct amounts can lead to hefty fines and penalties. You are required to pay estimated taxes on federal taxes, and sometimes state and local taxes as well. Be sure to verify the rules for your county and state. A business with employees must also take measures to set up payroll services which withhold tax and sends it to the government regularly. These employers also need to consider additional insurance for employees, such as preparing for worker’s compensation and obtaining liability insurance. Businesses will also need to determine which accounting method they will be using, although larger companies may be required to use the accrual method. Hiring employees involves obtaining the necessary requirements. The IRS provides an Employer Identification Number for free which is used to identify your business. This entity number is used on a variety of entity formation forms. A sole proprietorship does not need to obtain an EIN since it can use the owner’s Social Security number or tax identification number instead. Employees must have their payroll taxes withheld and sent to the government regularly. There are many types of businesses to consider when forming a company. Your business activity, liability protection, investing needs, and tax issues will help influence your best course of action. You can choose to form a sole proprietorship, partnership, LLC, C corp, or S corp. Each business type has pros and cons; some are easier to file, while others offer more stability. It can be a complex decision and is usually worth your time to consult with a tax professional or lawyer to ensure you are set up correctly. It may also help to seek legal counsel when creating your bylaws, operating agreements, and articles of incorporation. Start by selecting a business name, then pick a legal structure, set up your finances and taxes, and file all necessary paperwork. Carefully consider a physical location, if necessary, and prepare for hiring employees. Remember to conduct a business entity search in your state to ensure your business name is not already in use. Using the same name as another company, even if it is in a different industry, can lead to confusion for the customer. Due to the complex nature of forming a business entity, it is highly recommended to consult with an attorney to ensure you are not missing any legal or tax requirements at your local, state, or federal level. For assistance with your business entity, reach out to the professionals at Anderson Advisors today.